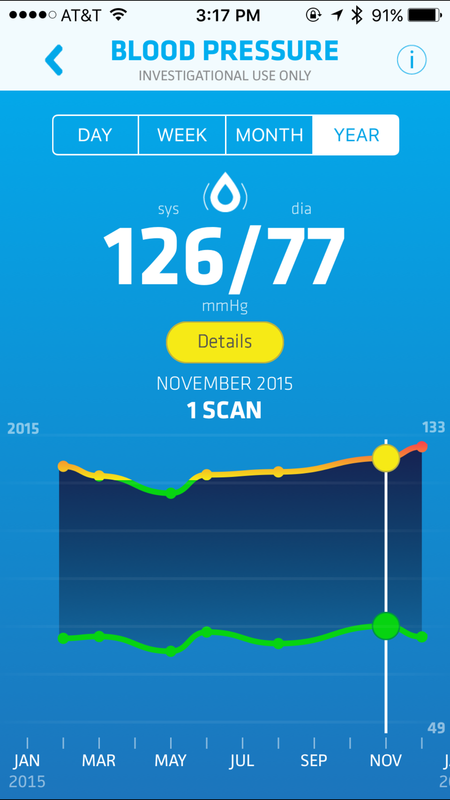 One of the areas of Tech Everywhere that I’m interested in is personal monitoring. This area is sometimes referred to as the Quantified Self. For a few years now, through smartwatches and other devices, I have collected lots of data about myself. I’ve shown much of that data in my reviews of the Microsoft Band and other devices that gather information about my heart rate and sleeping patterns. 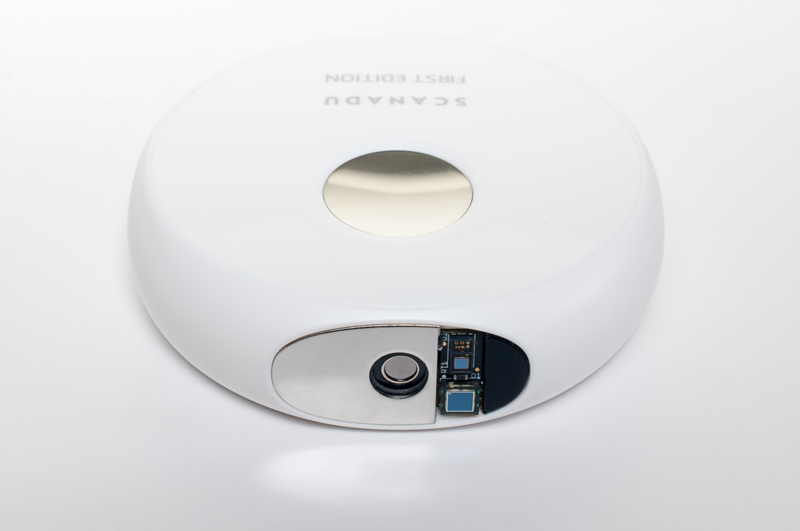 This picture shows the Scout’s touch sensor, infrared thermometer, and SpO2 sensor. Based on that interest, I was very much looking forward to the Scanadu Scout, which I supported through Indiegogo. For $199, it promised to measure my blood pressure, heart rate, temperature, and oxygen levels (via pulse oximetry or SpO2). The campaign finished funding in July of 2013. I finally received the device in February of 2015. As if there aren’t enough hurdles for crowd-funded products, one of the big holdups in this case was FDA approval. Scanadu officially says it is for “investigational use only” in order to comply with the FDA requirements. I’ve been using the Scout periodically since then. I’ve waited so long to write about it in the hopes that software upgrades would improve the product, but they have not had much impact. Despite my general disappointment, the device gives an idea of what is possible in this area in the future. Ultimately, however, it leaves me wanting the next version of the product (or a competitor’s product) and wishing that all of these personal monitoring devices did a better job of working together (more about that in a future entry). This is how you use the Scanadu Scout. The first issue with the Scout is that it is not as easy to use as I had hoped. You hold the device in your left hand with one finger on a metal area on the top and place it against your forehead. After your phone lets you know it’s receiving a signal, you manually adjust the position, placement, and pressure of the Scout to get a good reading. Once you master that technique, you can get a reading in about 15 seconds. Until then, you’ll probably have to try a few times to obtain a reliable reading. Still, the Scout is easier to use than a traditional blood pressure cuff (and way less cumbersome, as you can easily carry the cordless, rechargeable, 2.5-inch-diameter device in your pocket). An example of the limited historical data and analysis offered on the iPhone app. I’m also uncomfortable with the results. My blood pressure numbers were routinely over 120/70, and I’ve never been measured that high in a doctor’s office or when donating blood. And I never got a valid temperature reading. As with many personal monitoring devices, there is no ability to look at results online. That means looking at graphs on my phone rather than a large screen. There is also little analysis or even much in the way of simple trending – such as whether my blood pressure has been rising or falling over the last six months. 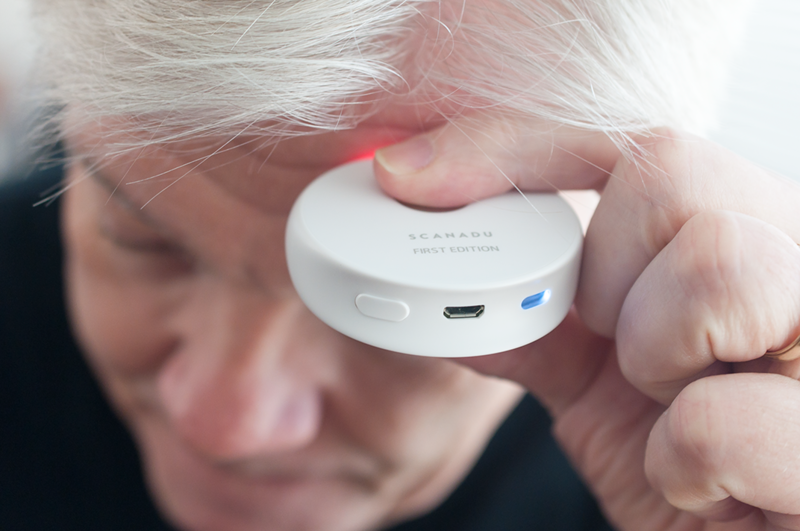 The company is developing an improved version of the product called Scanadu Vitals. They plan to use what they learned from the over 7,000 people in over 70 countries using the Scout. 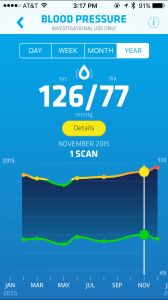 Scanadu is also working on another product tentatively called Scanadu Urine. Yes, they might want to think of a better name. Regardless, if that doesn’t tell you where this tech is going, I don’t know what will! The bottom line is that this product is not as accurate or as easy to use as I want it to be. It does, however, give me hope about where this technology is headed.